January 25, 2018 update: Developer 614 Edmond LLC removed the property, a planned 2-unit co-operative, from zoning hearings twice in order to allow more time for community process. Welcoming new architect Eric Booth from Desmone Architects, the developer will present revised plans at a public meeting within the next six weeks. 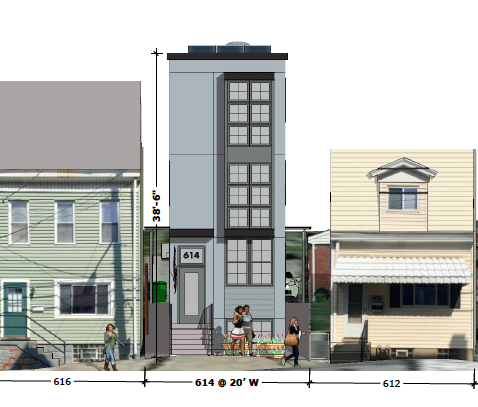 On Thursday, June 15, representatives for the 614 Edmond Street LLC (the developer) will present their plans to the community for a new 2-unit residence with two parking spaces in the rear. The development requires two zoning variances for which they will go before the zoning board on June 29, 2017 at 9am. the variances are for the number of stories (4 requested, 3 allowed), and reduced setback from 3 feet to 1.5 feet on either side of the parking pad. The meeting will be held at 6:30pm at Shepherd Wellness Community, 4800 Sciota Street (entrance on Mathilda side). Questions or comments may be emailed to christina@bloomfieldnow.org.